I am frequently asked what my favourite furnishings are. When it comes to coffee tables my response is always the series from Calligaris that include the Mascotte and Flexy tables. I have used these tables in several interiors.They transform in seconds from a coffee table with a top dimension of 27.5" wide x 41.25" long to a dining table with a top dimension of 55" long x 41.25" wide....a very generous size for 6 diners. The height is adjustable at seven different measurements, allowing you to set the perfect height for your sofa or dining chairs. If desired you can have a large coffee table of 55" x 41.25" or a smaller dining table of 27.5" x 41.25". I have sometimes used 2 of these tables in an interior, one as a coffee table and one as a dining table or desk in another room. This allows the user to put 2 tables together on occasion to create a huge dining table for 12-14 and when guests are gone they morph back into their diminutive forms! Furniture design doesn't get any better! Mascotte table with top closed and at desk height. And prepared for an intimate dinner and a movie for 6! 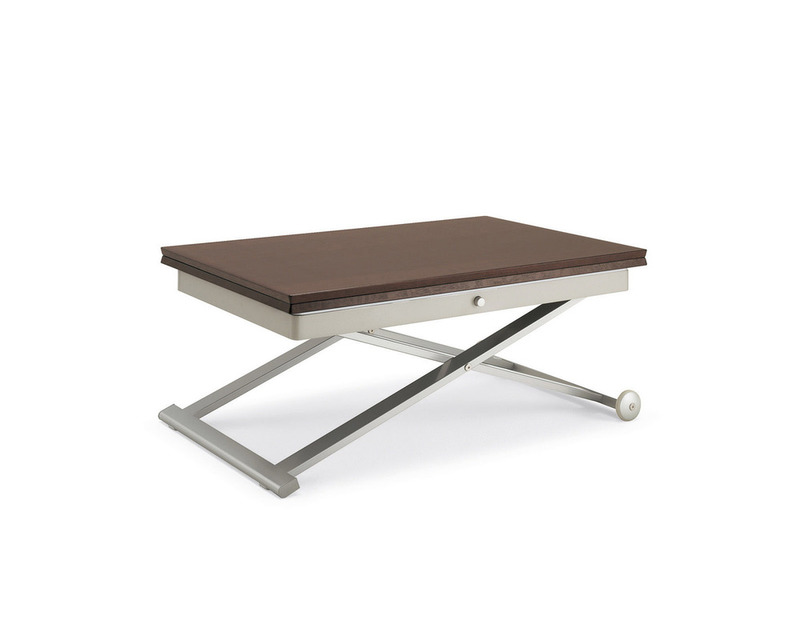 The Flexy table in metal and wood as coffee table. Press the button and the height adjusts! Flip open the top and swivel it 90 degrees to double the size!